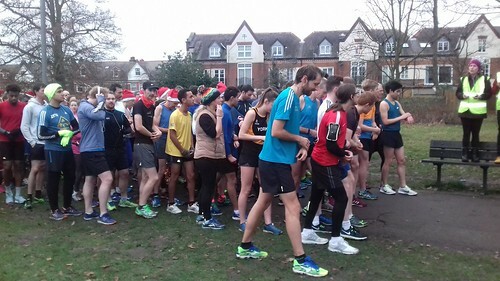 Saturday saw a fantastic crowd of 375 hit the Tooting Triangle for the last run before Christmas. Conditions were surprisingly warm and so most runners ditched their Fleece Navidad and ran in just a t-shirt and shorts. But a huge thanks to all volunteers who did make it and elflessly pitched in to make our event happen - all of you have earned your Christmas excesses. 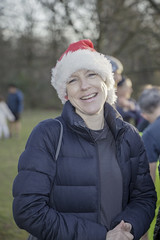 Please e-mail tootingcommonhelpers@parkrun.com if you are willing to volunteer in the coming weeks. We also saw some milestones! Regular Tooting Run Director Rob WOODWARD notched his 100th, as did Clapham Chaser Joe Dean. Laura BOYLE celebrated her 50th, and I am delighted that we saw a 10th run for junior Sid STEEDMAN - a noble effort. Well done all! See you all again next Saturday, and MERRY CHRISTMAS! With the prospect of all those roast dinners, mince pies and glasses of sherry, you could forgive the good people of Tooting to allow themselves a little indulgence this week. 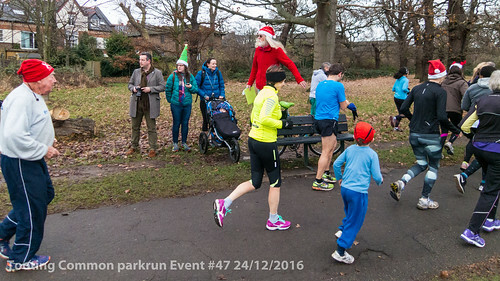 Nevertheless, 290 of South West London’s most intrepid parkrunners defied the chill to tackle the Trioundabout this Saturday (and earn themselves an extra mince pie). 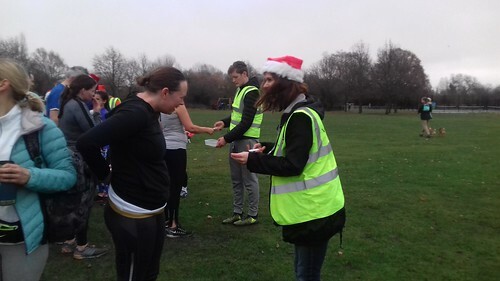 It’s got to be said that Mike Brewer earned himself more than just one extra mince pie as he completed his 300th parkrun in a fantastic time just 18 seconds off his PB, with only Paul Cook (320) and Louise Ayling (326) ahead of him! 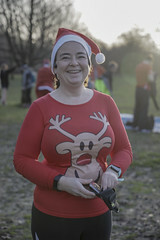 Louise gets an extra mention for doing the run in festive PJs – I mean, when you’ve done that many parkruns perhaps they’re not worth getting out of bed for – and Paul for being one of the 48 runners to score a PB. Joining him in the PB club were first lady finisher Sarah Grover, who came in 12th overall with a cracking time of 19:16, and third finisher Patrick McDougall in 17:46. 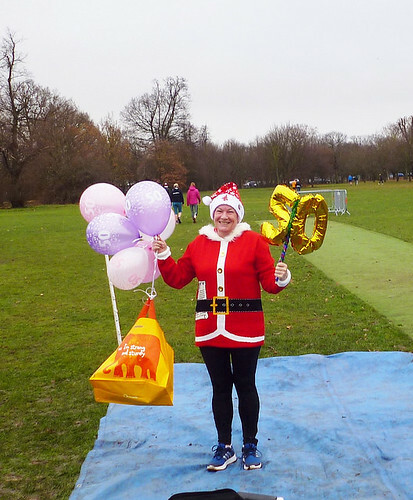 A special mention goes to Catherine Law too as she completed her 50th parkrun today - well done, Catherine! We were also proud to welcome a total of 28 official first timers to Tooting this weekend, not least of which were first and second finishers Tony Payne and Ben Wickham, and second lady Rachel Allen. Tony ran a blistering time of 16:12 – so blistering in fact that it took 1 minute and 14 seconds for Ben to join him at the finish funnel! In fact today’s parkrun counted as Tony’s first ever parkrun, making an impressive debut for the Serpentine RC runner. A massive welcome to the parkrun family goes to him and the 12 other runners completing their first parkrun today! Tony set a great example and hot on his heels was our fastest runner under eighteen, Tobias Allen, who finished in 18:19 and 6th overall. There was even more great running from the juniors, including a close fought battle between under-15s Mohan Stansfield and Finley Allen who finished in 21:21 and 21:23 respectively, and a speedy 22:35 from Thomas Burghes in the under 10 category. Now for my Christmas present to myself - the geeky bit! Of our 290 finishers, the fastest and slowest times respectively were 16:12 and 44:45, both relatively speedy times for Tooting. This means that our mean finishing time was 30:28 (closest result Tracey Eastabrook in 205th place) and our median finishing position was Mat Chambers in 145th, in a time of 26:10. 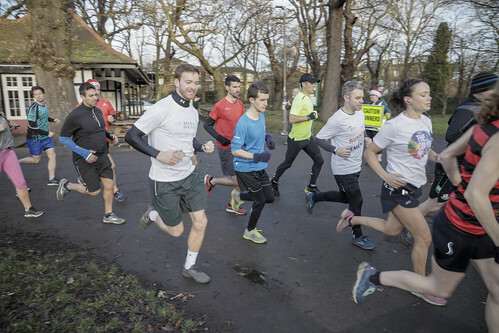 Compared with this time last year we’ve got 79 more runners, a 12% increase in the range of finishing times and twice as many runners inspired to do their first ever parkrun at Christmas. 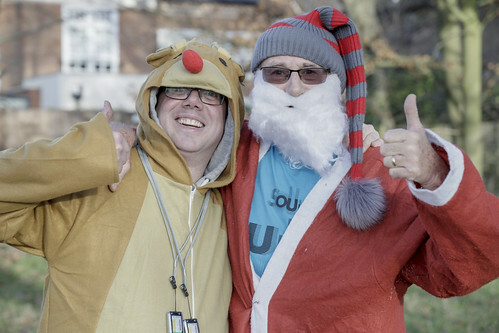 A HUGE thank you goes out to our 31 tireless volunteers without whom parkrun simply doesn’t happen, especially tail walker Mark Shotton whose encouragement and festive spirits helped bring everyone home safe and sound. And a reminder to the 43 unknown runners who left their barcode in their other running tights to print a spare – you’ll kick yourself when you’re a run short of a milestone! 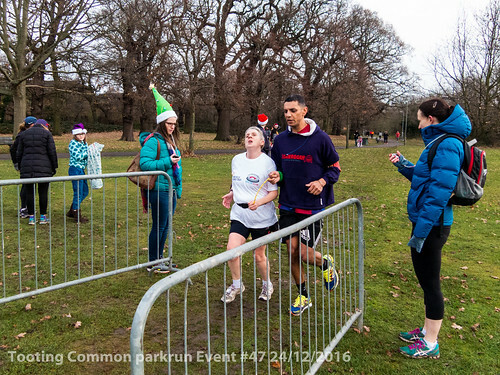 Click here for full results, and if you’d like to volunteer (especially during January) please email tootingcommonhelpers@parkrun.com – the more the merrier! 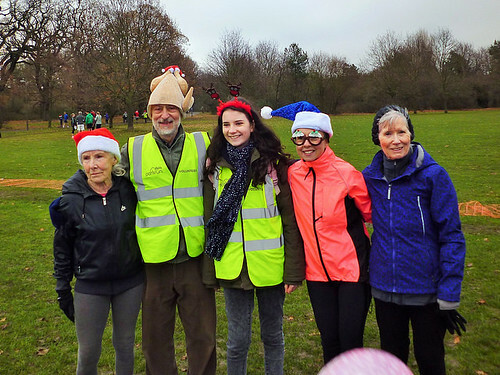 ‘Twas the morning before Christmas and all through Tooting Common 211 parkrunners stirred their way to 38 personal bests (some donning fairly ridiculous hats)! Christmas Eve at Tooting Common parkrun got off to a slightly fraught start when the event team realised there was no access to the local athletics track, which houses the equipment. Thanks to the volunteers for sorting things out – that can't have been a fun discovery early on a Saturday morning! Some quick thinking and an improvised funnel later and we were ready to run, and none the worse for it. 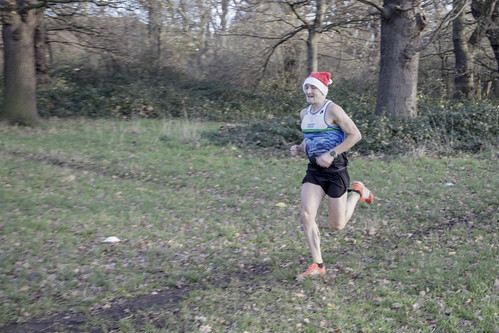 For the men, Deron Fagan of Herne Hill Harriers was first over the line, equalling the time of 17:17 he set in his first run at Tooting Common in late June. An unknown runner was second, and in third place came Phil Oddy, grabbing a new course PB of 17:52 in the process. 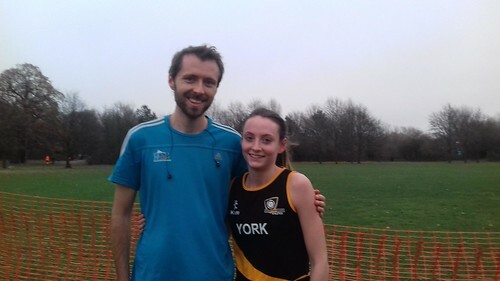 For the ladies, Megan De Silva finished first with a super speedy sub-20 in 18:56 at her first Tooting parkrun. Megan usually runs at Dulwich, so hopefully that run will be enough to persuade her to come back and we will see her again on the Tooting triangle soon! Second lady home was Marie Synnott-Wells in 20:31, who had a good day with this finishing position, achieving the highest overall age grading score and reaching her landmark 50th parkrun! Sophie De Rivaz was third in 21:19, which is an overall parkrun PB for this runner who hopes between here and Fulham Palace. 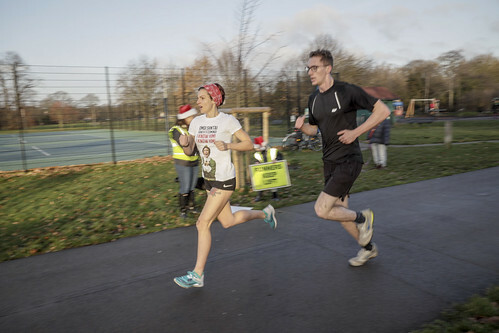 For the juniors it was Tooting regular Dylan Sweet who finished first in the JM category in 22:11, and Johanna Nicholson did likewise in the JW category by running 23:28 on her first ever parkrun. What a great start, and we hope to see Johanna again soon! Two runners well worth a mention are Lynn Cox who set a new Tooting PB of 34:49, ably assisted by one of Tooting's many regular volunteers Jaspal Dhalley. Well done to both. Imogen Swales is another runner deserving of a mention. Today she crossed the line in 31:17, yet another PB and an improvement of over 6 minutes on the time she set on her first Tooting parkrun of 37:30. Brilliant effort, Imogen! As well as Marie, who we mentioned earlier getting her 50th parkrun milestone earned, we also had Alex De Salis picking up the same title, and Donna Law getting her 200th! It was Donna's first parkrun at Tooting (she usually frequents Milton Keynes parkrun), and not only did she get this landmark she also accompanied her mum Catherine to a Tooting PB. Really inspiring stuff from all of the above, and a bit of motivation for us all! 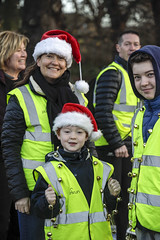 A big thank you also goes to the 29 volunteers who get there early, set up, cheer us round, scan our barcodes, sort results and – even more complicated – sort tokens. Parkrun is totally dependent on volunteers, and there are a huge range of roles available, even run report writer. And you can do that one sitting down and sipping prosecco, which I highly recommend! If you haven't volunteered yet, perhaps it is something that should go down as a New Year’s Resolution? 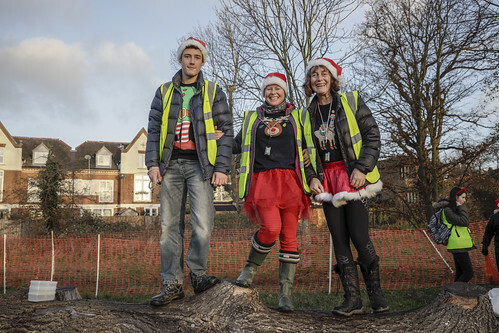 Finally, have a wonderful Christmas and we hope to see many faces, both familiar and new, on New Year’s Eve and New Year’s Day, when there will be an additional parkrun on Tooting Common at the later time of 9:45... Don't forget your barcode!